Campers who love to chase adrenaline won’t want to hang up their mountain bikes, kayaks or kiteboards just because summer’s over. Instead of parking the RV for the season, why not take advantage of smaller crowds and cooler weather to enjoy your favorite adventure sport? Autumn RV camping can be spectacular when you’re parked in a forest of fall colors, so there’s really no reason not to take at least one more trip this autumn. Here’s how. Cape Hatteras National Seashore, on North Carolina’s Outer Banks, is a primo kiteboarding destination, and home to some pretty fine autumn RV camping, too. If kiting is your favorite way to play, there’s nothing quite like the autumn winds that hit Hatteras. The Frisco campground operated by the National Park Service is open through November. It offers campsites among the secluded dunes on the Atlantic side of Hatteras Island. Legendary Pamlico Sound is a short distance away, so you’ll have two nearby choices for kiteboarding venues. Just in case you haven’t tried the sport before, outfitters on Hatteras Island can fix you up with lessons and gear. The national park RV campground is comfortable, but without hook-ups, so if you like more amenities there’s a private campground at Frisco Woods five minutes away. Two hours north of Minneapolis, Cuyuna Country State Recreation Area at Ironton, MN is a single track rider’s best autumn destination. In the first place, you’re going to find twenty-five miles of groomed trails twisting and turning their way among twenty abandoned iron mining lakes. The Cuyuna Lakes Mountain Bike Trail System is gaining notoriety with riders around the country, with five separate units of clearly marked and superbly-maintained trails. That should be enough to get single track fans packing. But just in case you’re wondering about the RV camping, you’ll also find the camping at Portsmouth campground on Portsmouth Mine Pit Lake close to the trails and plenty comfortable in autumn. For campers whose adventure sport is sea kayaking, the annual Autumn Gales event is a not-to-be-missed fall adventure. Coaches from several countries convene each October at the New England Science & Sailing Centre in Stonington, CT to work with a fortunate few. Taking advantage of the optimal waters of Fishers Island Sound, the group spends several days sharpening their skills through tiered training courses, in essentials such as rough water confidence and tide race surfing. It’s easy to reach Stonington, just two hours away from Boston and under three hours’ drive from your New York RV rental pickup. You’ll be happy to learn that Mystic KOA is only fifteen minutes from the event site and offers special campsite rates in September and October. Why not plan to camp awhile at this scenic, friendly campground while learning new skills that will put you at the top of your paddling crew back home? Did these ideas get your adrenaline flowing for another autumn adventure? Pick one or plan your own, but don’t stop camping just because the crowds went home. There’s a place that’s perfect for you to find adventure and enjoy the comfort and convenience of autumn RV camping, while you’re at it. We’re always here to help with the right RV! Travel north from Duluth, Minnesota along the northern shore of Lake Superior and you’ll come face-to-face with the grandeur of nature. All along the North Shore Scenic Byway (MN Hwy 61) RVers will encounter soaring cliffs, cozy, lakeside villages and views of Lake Superior that will stir their hearts. Add the mystery and beauty of an immense national forest, an abundance of private and public campgrounds and top-notch outdoor recreation, and you’ve got a trip that’s custom-made for RV travel. Did we mention how easy it is to stop and camp along Superior’s North Shore? Wise city planners in such scenic towns as Grand Marais and Two Harbors have set aside room for municipal campgrounds to serve travelers to Minnesota’s North Shore region. You’ll also find plenty of private campgrounds, most on or near the lakeshore, to call home as you travel Superior’s shoreline. Superior National Forest is another outstanding option for RV travelers to the North Shore, especially those who also love to paddle a water trail. Within the national forest, a one-million-acre area of interconnected glacial lakes has been designated the Boundary Waters Canoe Area. Multi-day paddling trips or a lazy paddle in one of the many lakes can fill your days. There are also multiple campgrounds within Superior National Forest that offer some form of RV campsite. Let’s talk some more about outdoor recreation. Lake Superior’s northern shoreline is a haven for hikers! Pick a section of the Superior Hiking Trail, a 300-mile pathway that parallels Lake Superior’s shore. It passes through most of the area’s eight state parks and is diverse enough to follow on an afternoon stroll or an overnight hike. You’re liable to find a lighthouse or two along the way, as well as breathtaking views of the lake from high above the shoreline. Go in search of waterfalls while in the North Shore Region and you won’t be disappointed, either. Gooseberry Falls State Park offers easy-to-navigate trails to all four of its waterfalls. A more challenging trail at Tettegouche State Park will reward hikers with views of three waterfalls, including the tallest waterfall in the state. And here’s a bonus for all RV travelers who follow Hwy 61 north from Duluth to the Canadian border: you’ll spy a waterfall or two right off the highway. What would a trip be to Minnesota, Land of 10,000 Lakes, without trying your hand at fishing? Fishing charters on Lake Superior, the region’s many rivers and the countless inland lakes will help you find salmon, lake trout, walleye and brook trout. If you prefer to strike out on your own, why not start by fishing from the piers at one of the area’s lakes? Prefer to spend your camping vacations less strenuously? You’ll find historic sites worth a look-see in every town along your route, from shipwrecks to vintage inns, lighthouses to 1890s log homes, the region’s rich history is on display all along the North Shore Scenic Byway. These homey lakeside towns will also tempt visitors to step inside their galleries, cafes and shops. Fishing, hiking, paddling and exploring your way along Lake Superior’s remote North Shore will net many happy memories for RV camping fans. Pick up a rental RV at your favorite location and plan to take your time; you won’t want to miss what Minnesota’s North Shore Region has to offer. Spend a summer day paddling the deep blue waterways along the US/Canadian border. Scan tall pines for eagles’ nests high above a granite shoreline. Hike cool, lush forest trails and stop to photograph a white-tailed deer just ahead. These are just a few of the ways your family can immerse itself in Voyageurs National Park in northern Minnesota, and camping in an RV will enhance your experience. Four interconnected lakes form the heart of this hiking and paddling paradise—Kabetogama Lake, Rainy Lake, Namakan Lake and Sand Point Lake. RV campers who enjoy kayaking or canoeing will find hundreds of acres of sky blue water to travel. Within those waterways, plan to explore the many islands, bays and inlets once traveled by the French-Canadian trappers who gave the Park its name. Prefer a little larger watercraft? Take a ranger-led boat tour to learn how the Ojibwe people helped early voyageurs navigate canoes filled with furs to Montreal. Cruise to an abandoned gold mine. Thrill the kids with a trip in the ‘big canoes’ used to ply the fur trade. Find where the ghosts of those early travelers linger. You’ll find a tour to do it all, led by friendly, knowledgeable guides. More than a dozen visitors’ centers through Voyageurs also offer the chance to learn the history, geography and culture of the Minnesota borderlands. From the magnificent Ellsworth Rock Gardens to the wonders of Kettle Falls Dam, every one of these discovery centers is reachable only from the water, so plan time for some paddling or book a boat tour before you come, through the Park website. When you’re ready to come ashore within the Park, take a hike to find natural wonders. Trails accessible by land or water range from those navigable by disabled visitors to strenuous hikes meant for seasoned hikers. Some of the most popular include the Beaver Pond Overlook at Ash River Visitor Center, the backcountry Kab-Ash Trail, the Oberholtzer Trail and the Anderson Bay Trail. Choose a spot in the towns of International Falls or Kabetogama or in one of the three state forests surrounding the national park. Book your campsites early, as this outdoor paradise is popular year-round. Here’s a directory to campgrounds surrounding Voyageurs, or use this guide to Minnesota campgrounds to start your search. 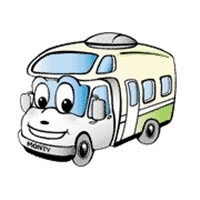 If you don’t own an RV, here’s where to rent an RV for the trip. Discovering the secrets of Voyageurs National Park can be a breathtaking experience for RV travelers. Whether in a quiet cove or along a sunlit trail, the beauty you’ll find will stay with you long after you’re home. Aren’t you ready to start planning your own trip north? Minnesota offers the traveler some special treats as far as fall foliage is concerned. What better way to see the brilliant autumn colors than to take an RV trip! In this way you can relax and drive comfortably through the countryside, taking in the sights. The red and orange leaves will just be starting to turn in September and they will peak between late September and early October in the central part of the state. For a Central Minnesota fall foliage trip, there is nothing much better than taking the Otter Trail Scenic Byway in Otter Tail County. This is 150 miles of pure pleasure. Follow the signs containing a happy otter. Delight in the maples, oaks and birch trees’ lovely hues and watch the lakes sparkle in the sunlight. Plenty of outdoor recreation is available along the way. Allow yourself enough time to take in all the wonders this Minnesota route will provide. Start your adventure in lovely Fergus Falls. While in town, you will find many museums to visit, great concerts or plays at the town’s Center for the Arts and of course, great shopping. If you love hiking, you’ll have access to the Pine to Prairie Birding Trail where you can get out and become one with nature. Visit the nearby lakes and fish for a trophy catch. Fall is the best time to stop at Maplewood State Park, because the trees are magnificent. A maple forest shows gorgeous colors in the autumn and it is something you won’t want to miss. Have a picnic on the shore of Lake Lida or hike into the woods and catch some glimpses of wildlife. Fishing is wonderful for walleye, bass and perch. Pelicans are the big thing at Pelican Rapids. This is an art scene and a real introduction to western Otter Tail County. Friendly folk will welcome you with open arms, and you will find plenty of outdoor fun all around. Easy access to over a thousand lakes is only one advantage to coming to Pelican Rapids. While here, a definite must-see is the Phelps Mill, a truly historic site. The History Museum of East Otter Tail is in Perham and is a must to put on your itinerary. You’ll view historic photos, interpretive exhibits and see some early motion pictures. The stories are memorable. There is also a fascinating doll museum located in the Chamber of Commerce building. You will now follow your route and drive past Rush and Otter Lakes and finally come to Glendalough State Park, a unique spot where you will see the fall’s changing grasses on a wet meadow. Take Beaver Pond Trail to see the best the park has to offer. Continuing on your drive, when you come to Battle Lake you may want to stop and admire the artistic work of regional artists and grab a tea in one of the coffee and tea shops. Fall festivals are likely going on too, so don’t miss that. Then you will shortly be back in Fergus Falls and at the end of your trip. What a wonderful fall adventure this has been! Picture credits: The picture of Fall Foliage in Minnesota is from the Wikimedia Commons. It is licensed under the Creative Commons Attribution-Share Alike 3.0 Unported license. The North Shore of Minnesota is a wonderful place to explore with your family on your summer RV vacation. This area is so inviting this time of year, with the lush landscapes and long warm days. You will discover a whole new world on the North Shore! Your adventure begins in Duluth where you should visit some of the museums, art galleries and stop by the Great Lakes Aquarium to enjoy the amazing fish of the Great Lakes. Of course you will want to get going on your driving adventure, so take off on Highway 61 to experience it all. When you reach Stoney Point Drive, be sure to take this short side-trip to see Tom’s Logging Cabin and travel to Stoney Point for a picnic. Stop off at Two Harbors for a snack or a meal and explore the town with your family. Burlington Bay Campground is the ideal place to park for a time while you enjoy the outdoor recreation. Hike the section of Gitchi Gami Trail or bike the path to get some great exercise and stretch those muscles. If you love waterfalls, you’ll love Gooseberry Falls State Park, known as the gateway to the North Shore. Wildlife is abundant here and you will want your camera so you can capture the feel of this Lake Superior shore. Gaze out over the lake, spot some ships, or simply relax and let all cares melt away. Camping is available here too. Enjoy walking sections of the Superior Hiking Trail through the park. Whether you are a rock climber or not, you should stop at Palisade Head. This is a place where serious climbers come to hone their skills. With the variety of climbs, Palisade Head offers something for everyone. If you aren’t a climber, you can still have a wonderful time watching others. Temperance River State Park,a bit further down the road, will be an incredible place to see the pine forests, watch cascading waterfalls and hike the trails through the spruce and birch trees. More rock climbing is available at Carlton Peak, and of course, revel in nature’s most lovely surroundings. Lake Superior shines in the sun and you will be inspired and intrigued with its deep water mysteries. Next stop should be Grand Marias with its harbor side galleries, shops and views. Dine on delicious food, stroll the town’s streets and enjoy the outdoor paintings everywhere. Throughout the year there are events and festivals going on which will entertain those of any age. Grab a cold drink and a burger and settle in for a long, quiet afternoon. Moving on you will finally cross into Canada and continue on Highway 61 to Thunder Bay where, again, you will discover a long list of events throughout the year. You may just discover a unique festival or boat race happening when you arrive. Stop at Eagle Canyon or go sailing on the lake. After your visit, you can go back or continue all the way around Lake Superior and loop back to Duluth or perhaps drop down into Sleeping Giant Provincial Park. The choice is yours! Have a wonderful RV vacation! Take an RV vacation along the great Mississippi River, traveling the Great River Road from Minneapolis to the Iowa border. The landscapes are sights that early explorers witnessed on their travels north. You won’t have the same kinds of adventures these pioneers experienced (Indians, wild animals and the like) but your excursion will still offer plenty of culture, outdoor recreation and relaxation. The best time to go is between April and November. RV camping is available at Town & Country RV Park and Campground, where the amenities are wonderful. They have a heated pool, and 80 campsites to choose from. Minneapolis is the center of much art, history and beauty. Tour the city before continuing on your journey, as you won’t want to miss the attractions here in this marvelous city on the river. To carry on, take US 61 out of Minneapolis but not before you stop at Mississippi National River and Recreation Area. Here you will find a 72-mile park with places to fish, launch a boat or canoe, or do some hiking. Further along on your trip, you can explore the Pierce County Islands State Public Hunting Grounds, extending into Wisconsin. Then travel along the shores of Lake Pepin where you can throw in a line and catch (perhaps) your trophy catch. You can also boat on this lake. If you love watching wild birds, Frontenac State Park is the spot to stop. In the spring and fall the migrating birds create a sight to behold. You can also hike this wooded valley, fish or swim. Wildlife viewing couldn’t be better than at Hok-Si-La Municipal Park, just north of Lake City and along the shores of Lake Pepin. Walk along the sandstone bluffs, enjoy the scenic views and be sure to try your hand at sailing these sparkling waters. You can also hike, swim or just walk the beach. The Mississippi Bluffs are a place to reflect and unwind. The nature around the Mississippi River is the best part of a trip along the river through Minnesota. Outdoor recreation is incredible here, like at the Nelson-Trevino Bottoms State Natural Area. Take off into the wilderness on a backpacking adventure. Do some rock climbing. In the fall, hunting is wonderful here. Further down your route, you can stop at the Wabasha Overlook to look out over the Mississippi and forested hills. There are over 3,000 acres of wooded landscapes at the McCarthy Lake State Wildlife Management Area, which give you the feeling you are in the past, a traveler of distant lands, heading west and just now discovering the treasures of this great land. Early explorers viewed these lands as you see them today. To get a wide view of the Mississippi River Valley, you can stop at John Latsch State Park. These are acres of lush green forest in the summer and incredible autumn colors in the fall months. Plenty of wildlife wander these 1,605 acres, such as fox, white tailed deer, coyotes and opossum. For another wildlife experience, you can visit the Upper Mississippi Wild Life and Fish Refuge near Wabasha. The confluence of the Chippeawa and Mississippi Rivers hold wonders like you’ve never experienced. You will see islands, marshes and wooded beauty. The Great River Bluffs State Park offers a wide variety of trees, such as oaks and maples, pines and hickory trees. Try and catch a glimpse of some wild turkeys, coyotes or ruffed grouse in the hardwood forests, and on the prairie lands you will see lizards and perhaps a bobolink or two. The amazing red-tailed hawks are often seen soaring overhead. Finally you will find US 61 merge with Interstate 90 along the shores of Lake Onalaska and you will have even more opportunities at some recreational pleasures. There are seven boat landings on the lake and the fishing is wonderful. You can catch some walleye, northern pike or smallmouth or largemouth bass. There are lots of panfish too! Get back on Highway 61 and continue to La Crescent, MN, known as the Apple Capital. You’ll simply have to stock up on the sweet fruit so it will provide great and healthy snacking for the rest of your trip. In La Crescent, you will take Highway 16 south to Highway 26 and continue your journey to the Iowa State line, south of La Crosse, MN. You have reached the end of your trek, but your journey doesn’t have to stop here. You can find your way back up this wonderful Great River Road and stop at any of the places that you passed up before. There is plenty to see and do in Minnesota, and you don’t want to miss a bit! This is the year to stretch your boundaries – to travel by RV to the northern edge of America along the mystically beautiful North Shore of Lake Superior. From Duluth, Minnesota to the remote harbor village of Grand Marais, North Shore Drive unlocks maritime history, exquisite scenery and outstanding RV camping possibilities. Come along as we map the journey! Duluth, MN, about eight hours north of Chicago, is the launching point for our once-in-a-lifetime journey along the North Shore. Plan to drive about an hour north along North Shore Drive, otherwise known as MN-61 N, to the lakeside village of Two Harbors. All along the way, Lake Superior will be on your immediate right, enthralling you with its immense beauty. If this is where you’ll be stopping for the night, make reservations ahead of time at Penmarallter Campsites, a Two Harbors RV park with a family feel. While in Two Harbors, make a trip to Two Harbors Light Station. This nicely-restored red brick lighthouse reveals much about the early ship trade on Lake Superior. Another nice stop to make along the route is found just thirteen miles north of Two Harbors at Gooseberry Falls State Park. Hike the trails to discover ancient lakeside lava flows, waterfalls that will make the perfect vacation photos and the rocky gorges that attempt to tame the Gooseberry River. Twenty miles north of Two Harbors, RV travelers will find another iconic North Shore lighthouse at Split Rock Lighthouse State Park. Visit the starkly scenic light station on its rocky promontory and then plan to hike at least a section of Gitchi-Gami State Trail that actually runs all the way to Gooseberry Falls State Park, or the highly-acclaimed five-mile Split Rock River Loop Trail. You’ll also find trails linking to the Superior Hiking Trail, where there’s never an inferior view. One more outdoor recreation possibility—fish for salmon and trout in the pristine waters of the North Shore. As you head north again on North Shore Drive, you’ll discover two scenic inlets, Beaver Bay and Silver Bay, both with appealing views and photo opportunities. The town of Silver Bay offers RV travelers the chance to put a boat into Lake Superior at Bayside Park, or you can simply walk the cobblestone beach and hunt for agates. Ready to stop for the night and gather your memories of the North Shore? The campsites at Tettegouche State Park, just north of Silver Bay, can accommodate RVs up to sixty feet in length. When you resume your journey along Superior’s North Shore, you’ll notice the immense, green wonder of Superior National Forest on your left. On the way to Grand Marais, our last stop, the abandoned buildings of Taconite Harbor bear testimony to the shifts in Lake Superior’s shipping industry. Your RV trek north will lead through Cascade River State Park, so by all means, stop and absorb the lush greenery and rugged views before moving on. And then we’ll stop in Grand Marais, a harbor village surrounded by a seemingly-endless wilderness and the rocky shores of Lake Superior. Get out and stroll past quaint harbor shops. Arrange a sea kayaking tour on the Lake with a local outfitter. Or paddle a canoe across one of the countless inland lakes close by. Spend as much time as you’d like; the Grand Marais Campground and Marina has a large RV campground right on the lakeshore. And on the way back to Duluth along MN-61, stop and savor the sights you missed on the way north. Lake Superior’s North Shore is endlessly enticing; it’s the kind of drive RV travelers dream of, and the lucky ones visit more than once. Did you know that Lake Superior, largest of the five Great Lakes, is home to nearly three dozen lighthouses? That should be enough to get your RV out of storage and headed north to explore beauty and maritime history on an RV vacation to visit Lake Superior lighthouses! One of the most scenic spots on Michigan’s Upper Peninsula is also the place to see a well-restored lighthouse built in 1871. Point Iroquois Light near Brimley features the original lighthouse tower and a picturesque two-story keeper’s dwelling. Just west down the shoreline, you can visit the site where the legendary Edmund Fitzgerald was lost. Skeleton-style Whitefish Point Lighthouse stands tall above the Great Lakes Shipwreck Museum housed in the keeper’s quarters. An additional thirteen lights have kept the shores of the Upper Peninsula safe over the years. Of special interest are Crisp Point Lighthouse, Au Sable Light Station on Pictured Rocks National Lakeshore, and Marquette Harbor Lighthouse, also home to an excellent maritime museum. When you need a rest from lighthouse viewing, Whitefish Hill RV Park near Rapid River comes well-recommended. And we haven’t even mentioned the amazing collection of lights on Michigan’s Keweenaw Peninsula! Many of these are on private property or in the process of restoration, and are best seen from the water via local charters. Two you can tour on land are Eagle Harbor Lighthouse and the Jacobsville/Portage River Light. The truly intrepid RV traveler can park the RV for a bit and take a five-hour cruise from Houghton or Copper Harbor to Michigan’s Isle Royale National Park. This rugged park, known for its backcountry hiking, boating and wildlife viewing, includes views of four historic lighthouses. Where the waters of Lake Superior wash against the Wisconsin shoreline, you’ll find a collection of lighthouses standing guard over Apostle Islands National Lakeshore. Nine great lights stand in varying degrees of operation, restoration or restored glory and some are open to guided tours. On shore, you can also see Ashland Breakwater Light standing out in Chequamegon Bay. An important RV camping tip: the City of Ashland offers very affordable RV camping at Kreher Park. In the Duluth, Minnesota area on Superior Bay, six lighthouses are clearly visible. From Canal Park Drive in Duluth, you’ll be able to see Duluth South Breakwater Inner Light, Duluth North Inner Breakwater Light, Duluth South Breakwater Outer Lighthouse and the ruins of Minnesota Point Light on the grounds of Sky Harbor Airport. As if that weren’t enough for lighthouse lovers, a short drive north to Two Harbors yields view of two more historic lights – Two Harbors Breakwater Light and the picturesque red brick Two Harbors Lighthouse. As you continue your lighthouse tour of Minnesota’s “North Shore,” plan time for a stay at Lamb’s Resort in Schroeder, MN, right on the shores of Lake Superior. That positions you perfectly for a visit to breathtakingly scenic Split Rock Lighthouse State Park. You can then venture a little farther north to visit Grand Marais Lighthouse before turning back for home. Three states, three dozen lighthouses and many excellent RV camping adventures… it’s the perfect formula for some serious travel fever! An RV vacation to visit at least some of Lake Superior’s lighthouses should be on the agenda of every maritime-history-loving RV camper. This was provided by our friends at the Shady Rest Resort & Campground in Villard, Minnesota. Minnesota is called the land of 10,000 lakes, but they probably just got tired and stopped counting at that point and went fishing. Smack in the middle of them all is the “Alexandria Lakes Area” where thousands of years ago glaciers carved their way through the area, leaving behind hundreds of lakes, nestled in the wooded hills and boundless prairie. Here you’ll find Shady Rest Resort and Campground on beautiful Lake Amelia. The Langhoff family has been providing a family vacation destination since 1978 offering exceptional lakeside cabins, overnight RV sites, and seasonal RV sites. Shady Rest Resort is open from May to October and located just 2 hours from Minneapolis. We have 2 tennis courts, pontoon and fishing boat rentals, bait and tackle shop, safe beach with a swim raft, great fishing, and much more. For over 100 years families have come to Alexandria, Minnesota and the neighboring Town of Glenwood to get away from the heat of the city, relax by a lake and do a little fishing or hunting. Today, more than ever, the area is the top Minnesota vacation destination for families. Alexandria offers visitors lodging at the many hotels in the city or a cabin or RV site overlooking a lake from one of the numerous local Resorts. For the fisherman, Lake Amelia has a little bit of everything, including black bullhead, black crappie, bluegill, bowfin (dogfish), brown bullhead, common carp, largemouth bass, Northern pike, pumpkinseed, rock bass, walleye, white Sucker, yellow bullhead, and yellow perch. Alexandria may also be the real “Birthplace of America”. At the Ruinstone Museum in Alexandria you’ll find the actual stone left by adventuring Vikings over 100 years before Columbus came to America and discover the mysteries about the stone that are still debated. The area is also known for it’s numerous antique shops and shopping, great golf courses, fabulous dinning, an indoor water park, 2 race tracks and the state’s largest winery, Carlos Creek Winery. For more information you can visit the Shady Rest Resort and Campground.